tories would love to put opposition-held ridings on the chopping block. 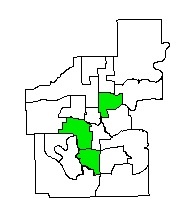 Edmonton-Riverview under the electoral boundaries created in 2003. I was not surprised to hear rumours that Edmonton-Riverview might be on the chopping block when the final report of the Electoral Boundaries Commission is released in July (the interim report had kept Riverview largely intact). The Tories have been trying and have been incredibly unsuccessful in capturing enough support to elect an MLA in Riverview since it was created in 1997. With decisive margins, Liberal MLAs Linda Sloan and Kevin Taft have been successful in holding off Tory challengers including Gwen Harris, City Councillor Wendy Kinsella, Fred Horne, and local president Wendy Andrews. I have read and heard many arguments in favour of disassembling Riverview, the largest being that it does not make sense for a riding to span across the North Saskatchewan River, which should act as a natural boundary (under the current boundaries, three Edmonton ridings cross the River). It is silly to argue that an urban MLA cannot represent a riding divided by a river when many rural MLAs represent ridings that span across the province. With three appointees on the five-member Electoral Boundaries Commission, the PCs may finally get their chance to put Riverview on the chopping block. Large-scale changes to Riverview were not included in the Commission’s interim report, but there were large changes to other opposition held ridings. Much of Edmonton-Cadler may merge with Edmonton-Glenora, a change that could pit former Calder NDP MLA David Eggen against Glenora PC MLA Heather Klimchuk in a riding that also has a tradition of electing Liberal MLAs. Edmonton boundary changes proposed in Electoral Commission's interim report with poll-by-poll results from the 2008 election. In Edmonton-Gold Bar, proposed changes in the interim report would give four-term Liberal MLA Hugh MacDonald an 8-vote margin, compared to a 1,018 margin of victory under the current boundaries in 2008. While sometimes overly-eccentric, Mr. MacDonald is one of the hardest working Opposition MLAs in the Assembly. It should not be surprising that the PCs have their eyes on Gold Bar, a riding that has elected Liberal MLAs since 1986. The changes proposed in the interim report are not entirely unkind to the opposition when looking at the 2008 election results. The interim boundaries reduce PC MLA Tony Vandermeer‘s margin of victory in Edmonton-Beverly-Clareview from 337 votes to 101 votes. Nominated New Democrat Deron Bilous is already gunning for Mr. Vandermeer’s job. 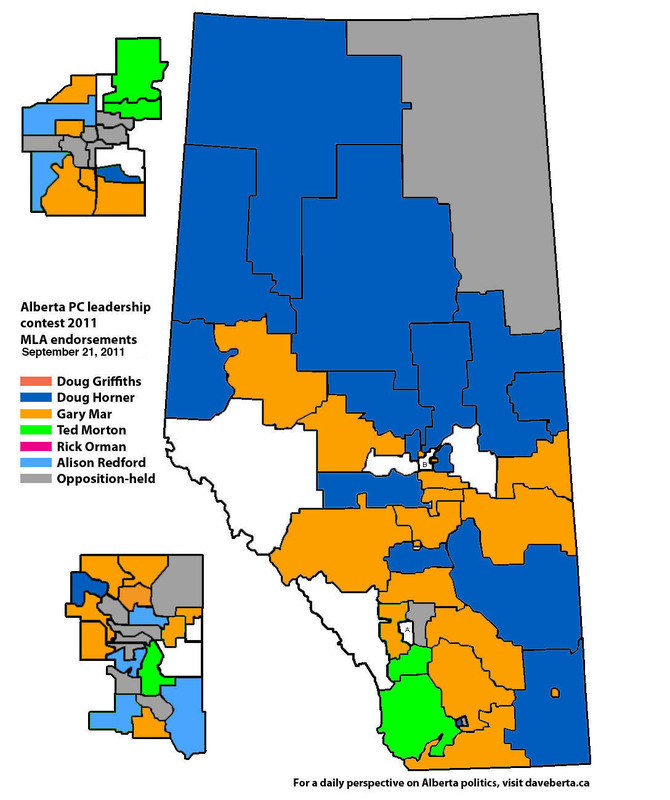 The interim boundaries would have also helped Calgary-Elbow Liberal MLA Craig Cheffins defeat now-Justice Minister Alison Redford by 272 votes (instead, Mr. Cheffins was unseated by 419 votes in the current boundaries). They are the most politically organized force province-wide, but it is understated how much of an advantage their 2006 leadership selection gave the PCs in 2008. Just over a year after their intensely competitive leadership race, large and fresh membership lists have the PCs a large advantage over their opponents, who had not developed these kind of large-scale lists. The next election will present Albertans with new electoral boundaries and also a new political environment. The PC Party’s popularity has significantly dropped in the polls since the last election and its caucus has shrunk by a by-election defeat and MLA floor-crossings. David Swann is the first Liberal leader from Calgary since the 1970s and his party is nearly debt-free. The Wildrose Alliance is on its way to becoming well-organized and well-funded under the leadership of the politically-savvy Danielle Smith. The existence of the new Alberta Party is drawing support from many centrist and progressive political organizers. There is a general unhappiness and unease among Albertans with how the politics of governance is being operated in Alberta. Even if some opposition-held ridings do get chopped and diced, the shifts in the political environment since the last election could make the could make any gerrymandering near irrelevant. This entry was posted in Alberta Politics and tagged Alison Redford, Brian Mason, Craig Cheffins, Danielle Smith, David Eggen, Deron Bilous, Heather Klimchuk, Hugh MacDonald, Kevin Taft, Linda Sloan, Tony Vandermeer on June 13, 2010 by Dave Cournoyer. tory backbenchers sat silently, then voted to gag the public accounts committee. Don Braid has published an excellent column in today’s Calgary Herald on the decision by Wetaskiwin-Camrose MLA Verlyn Olson and six other PC MLAs to vote in favor of weakening the power of the Public Accounts Committee to be a financial watchdog. As I wrote last week, the powers of the committee were curtailed when PC MLAs voted to create a new rule forcing Committee Chairman MLA Hugh MacDonald to have all future committee correspondence approved by Deputy Chair PC MLA Dave Rodney. When the issue was raised by opposition MLAs in Question Period, Premier Ed Stelmach, Education Minister Dave Hancock, and Deputy Premier Doug Horner have scoffed at the complaints, citing how powerless they are when it comes to influencing their backbench MLAs. As shown in Hansard transcripts of the April 14 Public Accounts Committee meeting, Only Mr. Olson and Mr. Rodney spoke in favor of the motion. Both Liberal Harry Chase and New Democrat Brian Mason spoke and voted against the motion. Not one of the five other PC MLAs at the meeting spoke to the motion. Edmonton PC MLAs David Xiao, Tony Vandermeer, Peter Sandhu, Doug Elniski, and Red Deer MLA Cal Dallas all sat silently until it was time to vote on Mr. Olson’s motion and they all voted in favor of it. UPDATE: After significant public pressure, it appears that Mr. Olson might introduce a new motion to withdraw his original motion at tomorrow’s meeting of the Public Accounts Committee. This entry was posted in Uncategorized and tagged Brian Mason, Cal Dallas, Dave Hancock, Dave Rodney, David Xiao, Doug Elniski, Doug Horner, Harry Chase, Hugh MacDonald, Peter Sandhu, Tony Vandermeer, Verlyn Olson on April 20, 2010 by Dave Cournoyer. 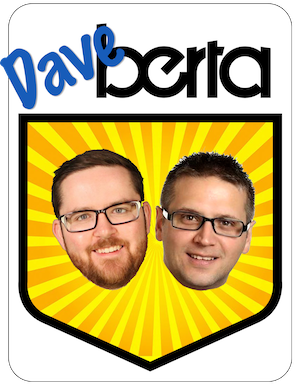 alberta politics: state of the opposition. They may have dropped to the fourth largest party in the Legislative Assembly in 2010, but the NDP are the first out of the starting gate to nominate a candidate for the 2012 election. 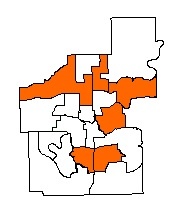 The Edmonton-Beverly-Clareview NDP have scheduled their nomination for May 5, 2010. As far as this blogger knows, local teacher and 2008 Edmonton-Centre candidate Deron Bilous is the only candidate seeking the nomination. The constituency was represented by NDP MLA Ray Martin from 2004 until his narrow defeat to Tory Tony Vandermeer in 2008. 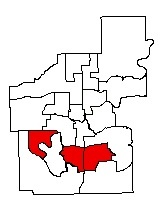 Under the interim proposed boundary changes for 2012, the new Edmonton-Clareview constituency would reduce Mr. Vandermeer’s 2008 margin of victory down to 101 votes. With recent polls looking quite different than those of 2008, past results could mean very little in two years. Word has it that a recent shake up in the NDP was not limited to their departing Executive Director. Some recent turnover on the board of executive officers has introduced some fresh blood onto the tiny party’s central bureau (since no table officers are listed on the NDP website, it is left to this kind of speculation). While they are reported to have raised $681,000 in 2009, insider sources have told me that slower economic times have contributed to a decline in individual donations in 2010, making staff layoffs likely. Not too far behind in their search for candidates is the Liberal Party, who I have been told are hoping to nominate candidates in Edmonton-Decore, Edmonton-Glenora, Edmonton-McClung, Edmonton-Mill Woods, and Edmonton-Rutherford by Fall 2010. The Liberals are reported to have raised $768,000 in 2009, but are struggling to even hold their support in the polls, a problem that has some Liberals talking about a palace coup. The Liberals may also be looking for a candidate to run in an upcoming by-election if rumors that one of two Calgary MLAs run for Mayor this Fall. A growing number of Liberals in Calgary are seriously talking about supporting a Mayoral bid by popular Calgary-Buffalo MLA Kent Hehr. One Liberal told me that Mr. Hehr “is seriously considering running for Mayor, and is currently arranging lunches with former Bronco heavy weights.” A by-election in Calgary-Buffalo would be an ideal opening for a new party with a potential candidate who has extensive experience organizing a winning election in that progressive downtown constituency. Meanwhile, Wildrose Alliance leader Danielle Smith is taking advantage of not being burdened with the responsibility of holding a seat in the Assembly by delivering campaign style stump speeches across the province. Ms. Smith’s party remains strong in the polls and raised nearly $700,000 in 2009 (most since she became leader in October 2009. This entry was posted in Danielle Smith, Deron Bilous, Kent Hehr, Ray Martin, Tony Vandermeer and tagged Danielle Smith, Deron Bilous, Kent Hehr, Ray Martin, Tony Vandermeer on March 31, 2010 by Dave Cournoyer.